Crafted from locally harvested maple. Maple Landmark baby toys are made of responsibly harvested maple -- the best, most durable wood -- with no applied chemicals at all, no finish and no inks. Any decoration is applied by laser. 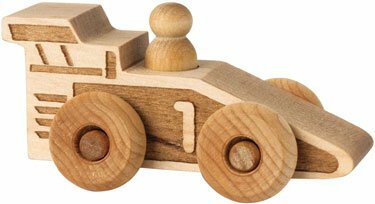 No need to worry about finishes or paints with the Schoolhouse Naturals line of wooden toys. These toys have no finishes whatsoever. With independently rolling wheels, these little scoots are great on any kind of floor.